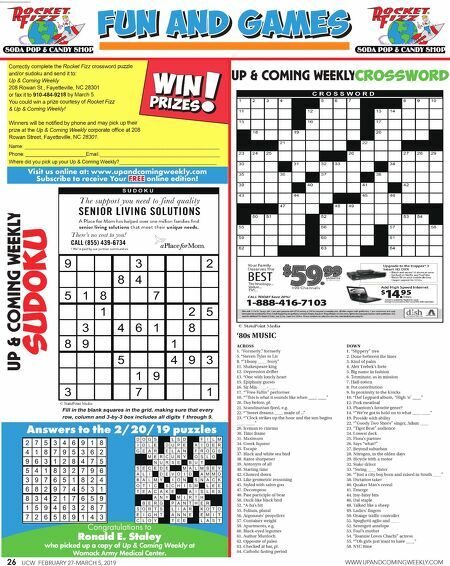 26 UCW FEBRUARY 27-MARCH 5, 2019 WWW.UPANDCOMINGWEEKLY.COM Correctly complete the Rocket Fizz crossword puzzle and/or sudoku and send it to: Up & Coming Weekly 208 Rowan St., Fayetteville, NC 28301 or fax it to 910-484-9218 by March 5. You could win a prize courtesy of Rocket Fizz & Up & Coming Weekly! Winners will be notified by phone and may pick up their prize at the Up & Coming Weekly corporate office at 208 Rowan Street, Fayetteville, NC 28301. 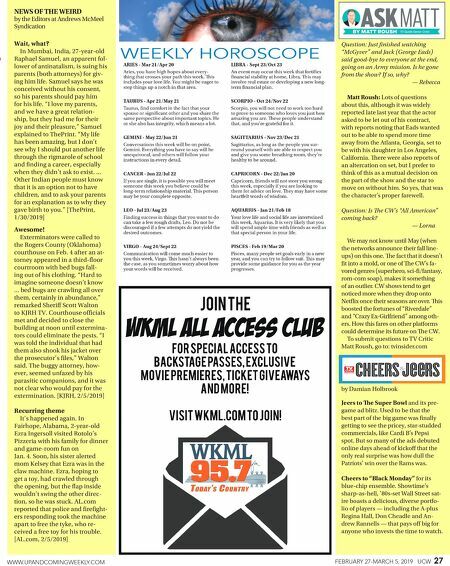 Name: ____________________________________________________________________________ Phone: ______________________Email:_______________________________________________ Where did you pick up your Up & Coming Weekly?______________________________________ Answers to the 2/20/19 puzzles Visit us online at: www.upandcomingweekly.com Subscribe to receive Your FREE online edition! '80s MUSIC ACROSS 1. "Formerly," formerly 5. *Steven Tyler to Liv 8. *"Ebony ____ Ivory" 11. Shakespeare king 12. Depression drifter 13. *One with lonely heart 15. Epiphany guests 16. Sir Mix-____-____ 17. *"Free Fallin" performer 18. *"is is what it sounds like when ____ ____" 20. Day before, pl. 21. Scandinavian fjord, e.g. 22. *"Sweet dreams ____ made of ..." 23. *"Clock strikes up the hour and the sun begins ____ ____" 26. Iceman to cinema 30. Time frame 31. Maximum 34. Greek liqueur 35. Escape 37. Black and white sea bird 38. Razor sharpener 39. Antonym of all 40. Starting time 42. Chowed down 43. Like geometric reasoning 45. Styled with salon goo 47. Decompose 48. Past participle of bear 50. Duck-like black bird 52. *A-ha's hit 55. Folium, plural 56. Argonauts' propellers 57. Container weight 59. Apartments, e.g. 60. Black-eyed legumes 61. Author Murdoch 62. Opposite of paleo 63. Checked at bar, pl. 64. Catholic fasting period DOWN 1. "Slippery" tree 2. Done between the lines 3. Kind of palm 4. Alex Trebek's forte 5. Big name in fashion 6. Terminate, as in mission 7. Half-rotten 8. Pot contribution 9. In proximity to the Knicks 10. *Def Leppard album, "High 'n' ____" 12. Pork meatloaf 13. Phantom's favorite genre? 14. *"We've got to hold on to what ____ ____" 19. Provide with ability 22. *"Goody Two Shoes" singer, Adam ____ 23. "Tiger Beat" audience 24. Lowest deck 25. Flora's partner 26. Says "what?" 27. Beyond suburban 28. Nitrogen, in the olden days 29. Bicycle with a motor 32. Stake driver 33. *Swing ____ Sister 36. *"Just a city boy born and raised in South ____" 38. Dictation taker 40. Quaker Man's cereal 41. Emerge 44. Itsy-bitsy bits 46. Dal staple 48. Talked like a sheep 49. Ladies' fingers 50. Orange traffic controller 51. Spaghetti aglio and ____ 52. Serengeti antelope 53. Foal's mother 54. "Joannie Loves Chachi" actress 55. *"Oh girls just want to have ____" 58. NYC time Congratulations to Ronald E. Staley who picked up a copy of Up & Coming Weekly at Womack Army Medical Center.